A few nights ago I had a call with Leon Cosgrove from Wipro about short interval control. We discussed the different ways miners can go to improve performance in their operations. Perhaps it was because we’re both involved in the consulting industry but somehow a 2 by 2 matrix appeared as we spoke. See below, we both thought it was helpful for describing the journey to a high performing operation. On the Y Axis is the extent to which the mine can measure and see where all their equipment is and what it is doing. There is a big range of technologies here but to keep it simple these range from sites with no way of knowing where anything is or what it is doing through truck counts and radio based tools like PitRam up to high precision fleet management systems like Modular, Newtrax or MobileARIS. Telematics and measurement are one thing but getting the data out of the pit is equally challenging, again simplifying terribly, technologies used range from nothing to radios, to leaky feeder to wifi and daisy chaining to LTE. On the X Axis is the extent to which the mine is planning and scheduling frontline operational work. On the left are operations that believe that a good mining schedule and perhaps a maintenance plan are able to be simply handed down to the operation to execute. On the right are the operations who have the frontline management systems and behaviours necessary to describe in short intervals what needs to be done each shift for everyone on the site. These operations engage religiously in the Plan Do Check Act cycle and use variances from the plan each shift, day and week to drive performance improvements continuously. With the matrix above it was interesting to think through the different routes to becoming a high performer, we came up with three options. 1.Technology first. Many operations have invested heavily in connectivity and fleet management systems that tell them where al l their machines are and exactly what is happening. 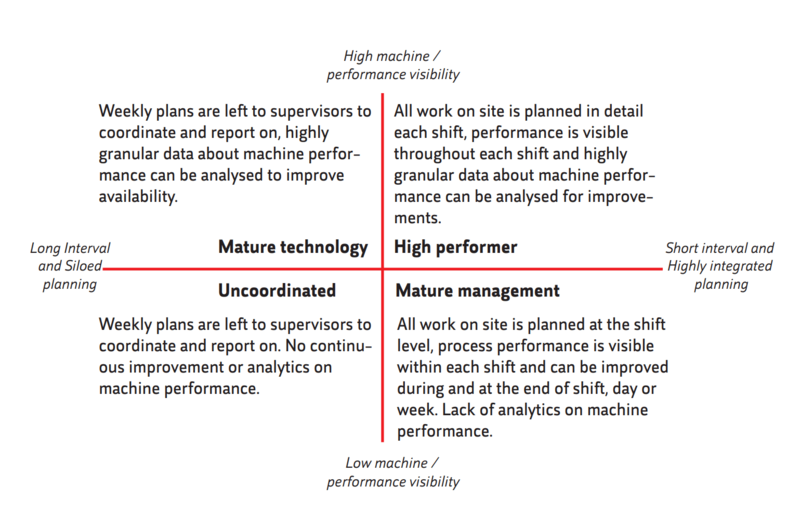 When these operations want to move towards the high performer quartile they have lots of high quality data but they still need to break their silos and perform short interval, integrated planning and scheduling. 2. Management first. Traditional management operating system (MOS) consultants have done huge numbers of projects with miners getting them to improve their frontline management planning and coordination. Short interval control is a tool often implemented during these projects. However, without an easy to use and integrated frontline planning and short interval control system (most of these consultants still sell spreadsheets and whiteboards) the mature management behaviours they have implemented are very hard to sustain. Operations that use these old fashioned MOS “systems” are very difficult to move into the “High performer” quartile in a sustainable way as the tools often break when the consultants leave. 3. Management and Technology together. 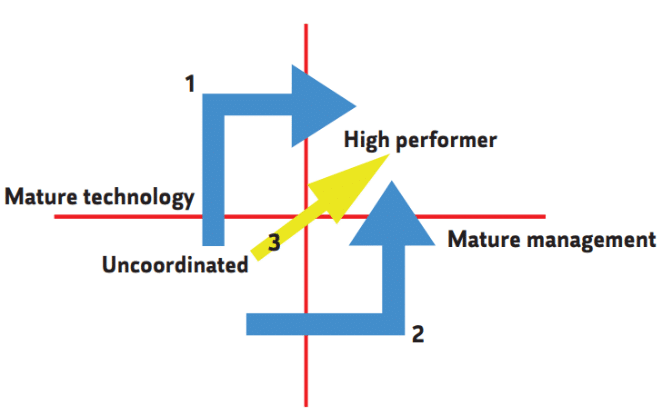 The most direct route to the High performer quartile is by integrating mature management practices with mature technology. This way the behaviours of the organisation can be directly supported by and embedded in the way the technology works. Critical to this transition is the use of a fully integrated frontline planning and short interval control system that can connect the enterprise planning systems to the operational technology that runs the mine. Done well this type of project uses mature management consultants to improve management practices while the technologists wire the system together to support mature management behaviours. This approach delivers rapid and sustainable results for much lower cost than option 1 or 2. Commit Works has been working with some of the largest and the smartest miners in the world to deliver massive production and safety improvements. Our fully integrated frontline planning, scheduling and short interval control system, Fewzion, has helped miners deliver 25% to 50% improvements in performance in less than 3 months from the start of implementation on site. Many of these sites have sustained their results for over 4 years through successive changes in management and ownership.